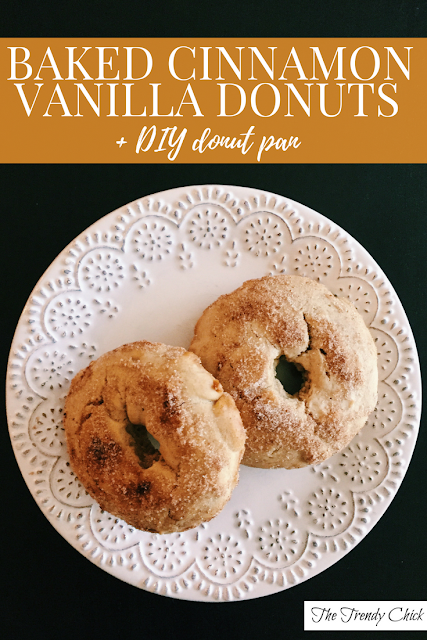 It has been way too long since I shared a good recipe on the blog, so I am back today to share this delicious baked donut recipe! On my new 101 in 1001 list, one of my goals was to bake my own donuts. I love donuts and I wanted to attempt to make some myself. Then a few weeks ago I found a recipe that looked great on Pinterest, so I decided to make them on a lazy Sunday afternoon. Except I didn't own a donut pan. Luckily, I found a way to make your own donut "mold" out of foil, and it included another yummy donut recipe that I decided to try. I got the recipe and the DIY donut pan idea from Top With Cinnamon, but I did one thing differently. Instead of rolling the foil into a donut shape, I just used a bagel I had and wrapped foil around it to create donut molds. I ended up just make 4 larger molds, so I got 4 giant donuts, but if you make smaller molds then you will get more donuts! Preheat oven to 425 degrees F (220 degrees C). Spray your (diy) donut pan(s) using non stick spray or brush with oil using a pastry brush. If you’re using the diy donut pans, place them on a cookie sheet. In a bowl, cream together the butter, vegetable oil, and sugars till smooth. Spoon the batter into a disposable plastic sandwich bag. Cut off the tip of one corner and pipe batter into the prepared pans, filling each cavity 2/3 full.Bake the donuts for 10-18 minutes, or until they’re a pale golden brown and a cake tester inserted into the middle of one of the center muffins comes out clean. Remove them from the oven, and let them cool for a couple of minutes, or until you can handle them. While they’re cooling, melt the butter for the topping (this is easily done in the microwave), and mix cinnamon and sugar(s) in a shallow, wide bowl. Remove the donuts from the foil/donut pan. Use a pastry brush to brush the each donut with the melted butter, then roll in cinnamon and sugar. Not too shabby for my first try at making donuts. I will probably buy a donut pan sometime soon since I would love to try more recipes now that I liked these. I just didn't want to splurge on a pan that I would only use once or twice! Have you ever made your own donuts? Share in the comments below!